If you live in Grayson, GA, and are looking for an AC repair company you can trust for all your HVAC needs, you’ve come to the right place. Our main goal at Cool Masters, Inc., is to provide every one of our customers with the best service in the industry, along with the highest ethical standards. Our technicians will always be straightforward with you about your HVAC needs in their honest, professional opinion. We want to help you save money, not pay for unnecessary repairs and replacements. No matter what your HVAC needs, our certified technicians have all the training and tools necessary to find the problem and make the repair as efficiently as possible. We are a family-owned business that has been serving the area since 2005, and we’re proud of all the work we’ve done to serve our customers in that time. Give us a call and find out how we can help you! HVAC systems have a lifetime of around 10-15 years if properly maintained. If your system is older than that, we would be happy to look at it and give you our honest opinion on whether you’d be better off with a new heater or air conditioning installation. Energy-efficient models will save you money each month on your utility bills by simply using less energy to keep your home comfortable. For your peace of mind, we offer no credit check financing, through Microf, on new installations with up to 60 months same as cash (also through Microf). We carry the best brands in the industry for your new HVAC system, including Carrier and Honeywell. Annual service checks are essential if you want to maintain the manufacturer’s warranty and help your HVAC systems last longer overall. Regular service checks mean fewer repairs and lower monthly energy bills. If you don’t want to worry about remembering to schedule maintenance, we offer a convenient Preventative Maintenance program. A well-qualified staff member will help you choose the best program for your home or office. The best part is that the program could end up paying for itself thanks to the monthly energy savings you’ll enjoy. 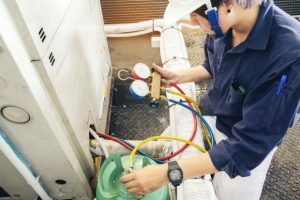 We know furnace or air conditioner emergencies can happen at the most inconvenient times, which is why we offer 24-hour furnace repair and 24-hour AC repair in Grayson, GA. Don’t hesitate to call us in the middle of the night if your system breaks down. We’re also available Monday-Saturday for non-emergency repairs. You can even schedule your appointment online at your convenience. Every one of our technicians is highly qualified to fix any HVAC issue, large or small. Our free estimates, 30-day warranty, and satisfaction guarantee ensure you won’t be disappointed. We even offer a free second opinion and a lifetime parts and labor warranty. Get $20 off your next heater or air conditioning repair service call when you “like” us on Facebook! Our technicians have a combined total of more than 45 years of HVAC repair experience, and we are confident in our ability to take care of any HVAC issue that may arise. At Cool Masters, our main goal is to maximize your comfort, health, and energy savings. If you have an emergency, no matter what time of day or night, give us a call. We’ll be there to fix the problem right away. Even in non-emergencies, we’ll always be prompt and respectful of your time. Schedule a service today!